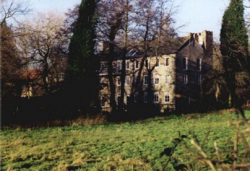 Linby Castle Mill (originally known as Top Mill and Upper Mill) and its reservoir – Papplewick Dam – were constructed by George and James Robinson in about 1782, west of Papplewick Village, along the edge of Linby Lane. After the cotton mills closed in the 1820s, this mill was converted to grind corn. It stopped work in the 1930s, and was rebuilt as housing during the 1950s. This is a picture of the north facade of the building. The ornate front of the building is its original form, and the ornamentation reflects stonework still seen today at Grange farm. Linby Lane used to pass across the dam, in front of the building. 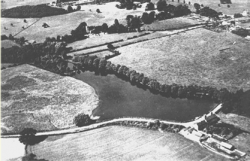 This aerial photograph shows Papplewick Dam, and Upper Mill (Castle Mill) from the southwest. Linby Lane crosses the dam wall, and winds in front of the building. This was altered in 1946 when the reservoir was drained. The reservoir site is now part of the Moor Pond Woods Project, with a riverside walkway. 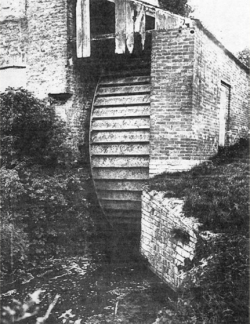 The water wheel at Upper Mill was a breast-shot wheel attached to the east end of the building. 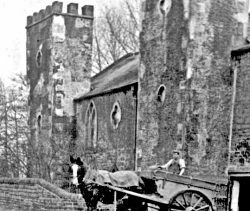 This photograph is believed to show the wheel in the late 1930s just before it was removed. The rear (south) of the building looks much more like a three storey cotton mill. This view was taken in 2000. The R. Leen still flows under the mill, and the water wheel was sited at the right-hand side. The building was converted between 1954 and 1962, gaining a Civic Trust Award for the work.